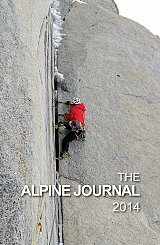 The Alpine Journal (or "AJ") is an annual publication by the Alpine Club of London. It is the oldest mountaineering journal in the world. Since 2004, the editor-in-chief is Stephen Goodwin. The magazine was first published on 2 March 1863 by the publishing house of Longman in London, with Hereford Brooke George as its first editor. It was a replacement for Peaks, Passes, and Glaciers, which had been issued in two series: in 1858 (with John Ball as editor), and 1862 (in two volumes, with Edward Shirley Kennedy as editor). The magazine covers all aspects of mountains and mountaineering, including expeditions, adventure, art, literature, geography, history, geology, medicine, ethics and the mountain environment, and the history of mountain exploration, from early ascents in the Alps, exploration of the Himalaya and the succession of attempts on Mount Everest, to present-day exploits. Issues from the last 40 years (bar the current issue) are freely available online. The second stage in this digitisation programme is intended to make all volumes back to 1863 available. ^ "The Alpine Journal : a century and a half of mountaineering history". The Himalayan Journal, Volume 60. 2004. ^ George Band (2006). Summit: 150 Years of the Alpine Club. London: Collins. p. 237. ISBN 9780007203642.